Audit finalization consists of compiling and documenting the information gathered during the audit. The audit package should provide an audit trail that is easily understood by third party users such as attorneys, hearings examiners and any others who may rely upon the audit in the future. The following is a summary of the audit write-up process: For more detailed information on processing audits, go to the various tax manuals online and to the applicable Audit Memos. WATS diskette or CD is uploaded onto the automated audit system. Automated audit summarizes the detail schedules (overnight process). Penalty and interest is calculated at this time. The audit package and diskette or CD are sent to the Processing Center. Agency Work Manager is updated with data from the field office and routed to the Processing Center. The audit is reviewed by auditors in the Processing Center who check for taxability, audit flow, and discrepancies between automated audit and the detail schedules. The Texas Notification of Audit Results is generated. The taxpayer's copy of the audit package is mailed to the taxpayer with the Notification of Audit Results. If further processing is required, the audit package may be sent to Audit Headquarters for generation of the bill and then Headquarters would mail the taxpayer's copy. Copy of audit package is imaged. The hard copy is later destroyed, as the imaged copy becomes the permanent file. The following is a sequential listing of forms, schedules, and documentation which make up the deficiency/credit audit package. Completion information is noted in this chapter. Other exhibits as necessary, including but not limited to: Power of Attorney, Letter of Authorization, Denial letter, Utility Usage Study, etc. Additional documentation (documents to be destroyed - audit history, inquiries, audit payment information, TCRs, etc. This form contains data that is essential to the processing of the audit. This is the form that is printed from the Agency Work Manager System at the time the assignment is sent to the Processing Center. Any special processing instructions should be noted in the Work Manager comments. The comment type to use is 'Auditor's Comment Notes to Review.' This will print in the comments section of the transmittal form. The audit period, tax type, taxpayer number, taxpayer name, and statute expiration date are based on information entered in Work Manager. Also, the 'Expedite regional processing center (RPC)' section of the Work Manager detail screen should be completed when applicable. This document, now prepared utilizing Comprehensive Audit Tax System (CATS), is required if there is at least one report period in the audit that resulted in a tax deficiency and on which audit penalty would accrue. For example, an audit may result in an overall credit, but there are some report periods on which tax is due. A Penalty & Interest Waiver Worksheet would be required in this instance. Please refer to the sections of Chapter 7 which details the Penalty & Interest Waiver Worksheet, Audits with Penalty over $10,000, Audits with Penalty Waiver Less than $10,000, and Criteria Favorable and Unfavorable for Penalty Waiver for detailed discussions on these topics. Below is an example of an audit cover letter retyped by the Processing Center but based on what the auditor submitted. This is for original audits only, and it is also prepared utilizing CATS (AUDIT DOC/AUDIT WRITE-UP). Each exam should be briefly mentioned with the type of adjustment made. The audit method (detail, sample, or estimate) also needs to be mentioned for each exam. Below is an example of an Audit Report retyped by the Processing Center, but based on what the auditor submitted. Everything that is listed on the index is included in the taxpayer's copy of the audit package which is mailed to the taxpayer by the Processing Center. All exams must be listed, with adjustments that are included in the audit. Each exam needs to be listed in numeric ascending order. Below is an example of an Index retyped by the Processing Center based on information provided by the auditor. This is the original Penalty and Interest printouts (from upload) from the audit field office. These are computer generated reports that print out after the audit has been successfully uploaded in WATS. This is the WATS printout that summarizes the tax due for all exams in the audit. Note: If there is more than one Agreement to Extend, all agreements must be included in the audit package. The most recent agreement will be page one, with all other agreements following. Exhibit IV, etc. - any additional exhibits needed. For example, Power of Attorney, Letter of Authority, Denial Letter, correspondence, etc. The Audit Plan should include all audit procedures employed, dates of meetings with taxpayers and who attended, audit decisions, listing of events and any other pertinent documentation to support the audit and its findings. This document is a required part of the final audit package, and it is placed behind the Audit Plan. The questionnaire needs to be signed by someone who has the authority to enter into agreements on behalf of the entity, usually a corporate officer/director or the owner of the company. For more information on the Audit Questionnaire, refer to Chapter 2 of this manual. Work papers that are to be imaged but not become part of the audit package that is mailed to the taxpayer need to be placed behind the Audit Questionnaire; however, these items need to be placed on top (and not inside) of the audit folder. Some examples of these would include assignment documentation, audit lead documentation, copies of contracts, copies of invoices, etc. The audit history, inquiries, report, or documentation that may be required to review the audit should be included inside the audit folder. Any items placed inside the audit folder will not be imaged. The diskette serves as a backup of the WATS files, Excel spreadsheets, word documents, forms, and any other data deemed pertinent to the audit assignment. All files are saved under the taxpayer number folder in Data96. The back-up feature in WATS is used to create the diskette that is sent to the Processing Center. The individual audit office is responsible for the integrity and accuracy of the data on the diskette submitted to the Processing Center. Audits will now be backed up on CD's. The same information stated just above regarding audit diskettes applies to audit CD's. The following information must appear on the label placed on the CD case as well as the CD itself. A permanent marker (felt-tip pen) is used to write the information on the actual CD. Do not place a paper label on the CD. All files related to an audit (Excel spreadsheets, Word documents, PDF files created by CATS) must be saved under the taxpayer number folder in Data96. The backup feature in WATS is used to create the CD that is sent to the Processing Center. The individual audit office is responsible for the integrity and accuracy of the date on the CD submitted to the Processing Center. Any notes to audit reviewers need to be made in Agency Word Manager/Comment Window/Note to Reviewer Comment. These notes would consist of instructional or informative comments written by the auditor, supervisor, or manager to the Processing Center. Do not use RPC Comment as this for use by the Processing Center staff. An audit will be assigned to the auditor's in-basket in Agency Work Manager. The information that is needed and the data fields required to be completed prior to submitting the audit to the Processing Center will be discussed in this section. Select the assignment through In-Basket or Search Facility. Via Navigate/Detail/Work Item Detail or Work Item Detail icon, double click on the highlighted assignment in the In-basket. The following Work Item Detail fields are required to be completed by the auditor or the audit field office before the assignment can be completed. Many of the items listed above have drop-down selections. The auditor chooses the option that applies to the assignment. All other fields will be auto-filled with information from other areas of Agency Work Manager or are optional fields. Click on the SAVE icon after the above fields have been entered. The auditor should also complete the screens for Taxpayer Errors, Contact Data, Refund Requested (Refund assignments only), and any other screens applicable to the assignment. The audit period is entered in MMDDYYYY format. When a beginning audit period is entered or updated, the Statute Expiration will 'auto fill.' A pop up window will appear to confirm the statute expiration date. This date is very important. The date should be changed to reflect any statute expiration dates that have changed due to signed statute waivers. The Statute Expiration dates will need to be updated for any assignments that may not have dates shown in this field. An authorized audit Contact must be entered for each assignment. The Contact name, title, and business name should be entered. The business name may or may not be the audit business name. Address and Phone tabs should be verified. These fields should auto-fill from the XISUMM inquiry. Any necessary corrections should be made if the information is incorrect. The system should be corrected as well as the Agency Work Manager fields. The Purpose tab should be completed for each contact. The Remove tab is available to delete entry errors. The Add tab is available to add additional contact types. More than one purpose can be selected for each contact. Use the same procedures as for the Purposes tab. If the audit is No Tax Due, select the No Tax Due Letter as the correspondence type for the audit authorized contact. This screen is used to address the No Tax Due letters. After entering the necessary information, click on the Save icon. Enter an estimated amount for issue #1. Fact situation, auditor's position/research, and taxpayer's position should all be completed for each issue. To enter, mark the radial button beside each section and enter the text in the box to the right. To add a new issue, click on New Issue icon and proceed with the instructions above. Business Description tab should contain a detail description of the taxpayer's business activities. The auditor should save and route the assignment to the Supervisor/Manager with the task of Forward to IAR. All parties should make sure that the Close box is not checked for the Lead Auditor. The comments can be edited before the assignment is sent to the IAR but not after. After review, the Supervisor/Manager should route the assignment to the IAR with the task Conduct IAR. The IAR will prepare the preliminary report and email it to the manager/supervisor for review. Any disagreements are noted and e-mailed back to the IAR. The final report is then sent to Audit HQ for approval or disapproval. Select via Navigate/Detail/Notices or the Notices icon. This window records the notices sent to the taxpayer. This window allows you to view or update the type of notifications sent. This is where the auditor enters the manual notices sent to a taxpayer such as Statute Waiver, Notification of Sampling, and Second Notification Letter (sent certified mail). To add a notice, select File/New/Notice or the New Notice icon. This will open a new line on the window. Complete the fields and Save. Issue Date = the date the notice was issued. The default is the current date, but it would need to be changed to reflect the actual date sent/delivered. Response Date = date response was received from the taxpayer. It is not completed for the Audit Notification Letter. The Sample and Population Bases must be consistent (i.e., Gross Sales sampled - Gross Sales projected). Population Base periods entered on 'P' flagged transactions must be consistent with the report periods filed by the taxpayer (i.e., if the taxpayer is a quarterly filer for the audit period, then the Population Base entries must be listed in quarterly amounts). Confirm reported base amounts shown on the history if reported amounts are used for the Population Base. If reported amounts are used for the Population Base, make sure zero periods or any periods with erroneous amounts are corrected. This process is referred to as overlaying. Overlaying is done on the 'P' flagged transactions for the sample exam. Use an 'R' for reported on the Exam Data screen and then enter the correct amounts on the 'P' transactions only for the periods needing correction. The Sample Base must be entered in the 'Base Amount' field for 'S' flagged transactions on all sample exams, regardless of whether external or reported amounts are used. Depending on the type of sample, the sample base may require one entry or multiple entries. When an external base is used for the population base and several accounts are added together to calculate the audited base, then a supplemental schedule is needed to document these external amounts. However, if the external base is made up on only one account and no calculation is made, this can be footnoted on the footnotes to the specific exam screen and a supplemental schedule will not be needed. It is important that the amounts in the audit can be traced back to the taxpayer's records. Confirm that sample audit adjustments scheduled are within the sample periods. A special local tax projection adjustment needs to be made in a sample to allow for local jurisdictions which are scheduled that become effective during the audit period (i.e., SPD taxes). All necessary information to duplicate the sample must be retained. The audit package sent to the Processing Center for other taxes (all other taxes besides sales tax) should contain the following fully completed documents. The asterisk (*) indicates that the document is internal and not sent to the taxpayer. Audit Adjustment Report - Summary tax amounts from detail schedules should be forwarded to the Audit Adjustment Report (AAR). Do not list the Audit Adjustment Report on the Index to Working Papers. This report is an internal form which is not sent to the taxpayer. Summary and Detail Schedules - Schedule headings should be complete. Excel schedules should be used. Schedules should reference the source of adjustments and also have forwarding footnotes. All calculations should be shown on the schedules. Refer to the specific tax manual for more information. These audits are completed at the field office level. 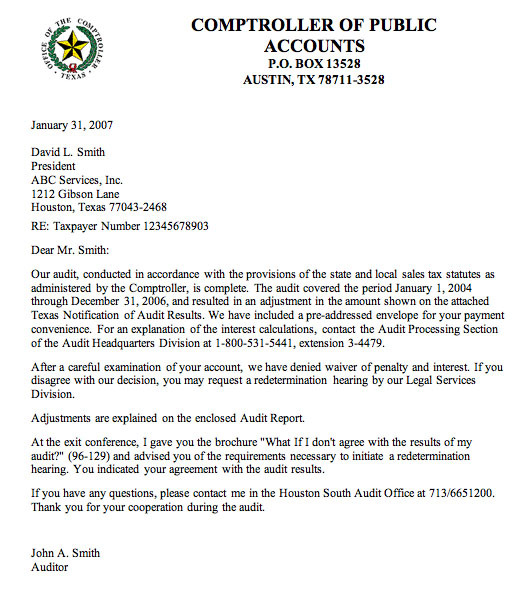 A generic No Tax due Letter will be generated by the computer system and mailed from Austin when the audit is completed on the system. Make certain that the audit period, tax type, and all other information is correctly entered on Agency Work Manager. Audits that are amended to zero will not have an index or any audit schedules. These assignments must be uploaded and a Penalty and Interest printout showing zero tax due must be included with the audit package sent to the Processing Center. When writing up an amended audit, it is always necessary to begin with the original audit adjustments and make changes. For sales & use tax audits that were originally performed using WATS, follow these procedures. Request the original audit backup file from the Processing Center. Do not use a backup copy which was kept for your own files because corrections could have been made on the original audit at the Processing Center. If your PC still has the original audit on WATS, it must be removed so the Processing Center's audit file can be restored to WATS. From WATS click File\Restore or click on the Restore icon. Once the window pops up, click the Restore As Amendment button and the necessary codes will be changed in the assignment. The Audit Type will be changed from O to 1. All amended exams and schedules should be titled as Amended. If an exam is entirely zeroed out, inactivate the exams. Do not try to zero out each transaction. Write in the Audit Amendment Request form that the exam was deleted. An Amended Audit can never be turned in until there is an assignment generated in Agency Work Manager. Auditors do not have the authority to set up an Amended Audit unless approval has been given by the Group Supervisor. Include the Hearings decision and any pertinent documentation behind this form. Complete the auditor comments section on the Audit Amendment Request form regarding any changes made in the amendment. This form is required if there is a change in the penalty and/or interest waiver decision from the last time this audit was processed. If the Hearings decision addresses penalty and/or interest, the hearings decision will prevail and a waiver form is not required. The waiver instructions should be communicated to the Processing Center on the Agency Work Manager Notes to Reviewer comments. If Audit HQ originally granted waiver and the facts or tax amount do not materially change from the original processing, a new Audit HQ decision is not required. If the penalty is now greater than $10,000 (and the original penalty was less), a new Audit HQ decision is now required. If the facts or tax amounts materially change from the original processing of the audit, a new Audit HQ decision should be obtained. The Amended Audit Report is used for both In-House amendments and amendments generated through Hearings. There is a template located on the Audit Cover Letter tab in the Template file. The addressee should be noted on the bottom of the report and is used to address the envelope. The addressee for the amended audit package should also be noted in the Notes to Reviewer comments section of Agency Work Manager. If copies of this report are to be mailed, a 'cc:' notation should be made on the report and in the Notes to Reviewer comments section of Agency Work Manager. This information will be typed on the report. Any original exams that have changed from the original, or last processing of the audit, should include 'Amended' in their title. Any new exams added due to the amendment would not include 'Amended' in their title. This is the original P&I printouts, from upload, from the audit field office. These are computer-generated reports that print out after the audit has been successfully uploaded in WATS. All pages should be sent to the Processing Center even though the Audit Adjustment Report is the only one listed on the index. Exam Summary - Detail - Required for all detail exams. All detail exams that remain in the audit assessment should have one of these. Exam Summary - Projection (After Modifications) - For projections only - include for any projection exams that remain in the audit assessment. Exam Summary - Projection - For projections only - include for any projection exams that remain in the audit assessment. Detail Report - Required only on amended exams or on any newly added exams. Detail Population Base report - For projections only - for amended exams or newly added exams. Detail Sample Base Report - For projections only - for amended exams or newly added exams. Supplemental Exams - these are normally Excel spreadsheets submitted as supporting schedules for the exam data. These should only be included form amended exams or newly added exams. Any exhibits that are new to the amended audit package should be listed here. The Exhibit numeric designation should begin with the next appropriate number that was not used in the original or last processing of this audit. This is primarily a listing of events noting the amended audit procedures and changes that were made to the audit. This is not as in-depth as an original Audit Plan. The folder should contain a properly labeled diskette or CD and any miscellaneous necessary documentation. Diskette/CD: The diskette or CD should be labeled as previously discussed in this chapter in the section dealing with audit completion of an original audit. The diskette or CD should be labeled with either original or amended. Additional Documentation: Include, inside the audit folder, the taxpayer history, inquiries, and any other documentation that may be required to assist a third party during the review process and to support the audit procedures utilized. The original audit package (hard copy) should be submitted only for those audits that have not been imaged. This would also apply to any other audit packages if the audit has been amended more than once. Note: If the original audit has never been imaged, the entire original audit package will be sent to the field audit office. The easiest procedure is to download the amended audit assignment into WATS. A second transaction with a positive $1.00 allocated to State only. The audit upload should be completed in the field office. This requirement is in addition to those listed in Audit Memo AP 58 and any instruction previously discussed. There should be an Amended Audit Report but no Index or Exam Schedules. Remember to include all upload printouts with the audit package. Index - Include exam summaries but not detail reports for exams not amended. A new manually prepared Audit Adjustment Report, if required by the tax type being audited, must be prepared with 'Amended' included in the title. A new manually prepared Summary of Tax Due, if applicable, must be prepared with 'Amended' included in the title. Any original Excel exams must be included in the audit package if amendments are made to the exam. 'Amended' must now be included in the title, and footnotes must be added stating why amounts were changed or why the amounts were zeroed out. Each transaction on the exam can be zeroed out with an accompanying footnote stating that 'the exam was deleted due to a Hearings decision.' However, if there are numerous transactions on the exam, this method could be quite tedious. For more information on the various types of open collection records, which records to close, which records to leave open, and the CICS inquiries used to research the records, please refer to Chapter 4 - Audit Completion of the Sales Tax Policy/Procedures Manual. Be sure to only back up the audit that is being written up for processing. Do not send an 'All Data Backup' (all audit assignments in WATS) to the Processing Center on the diskette/CD. Excel and Word files need to be saved under the taxpayer number folder created by WATS under 'c:\data96. These files will be zipped along with the WATS information for the current audit when the audit is backed up using 'Back-up Current Audit' in WATS. One zip file is created containing both WATS and miscellaneous (Excel, Word, etc.) files. Exam titles within the same audit should be unique. If there are several expense exams, add a distinguishing comment, i.e., Adjustments to Expenses-El Paso Outlet or Adjustments to Expenses - $1 to $1,000. The auditor's initials and date of preparation must be in the upper right-hand corner of each schedule page. WATS automatically prints this information on the detail exam adjustment schedules. WATS obtains this information from the information entered when the audit is set up on the CATS System. The date on the WATS schedule is determined by the date the schedule is printed. The schedule page number must be on each page. WATS automatically generates this for detail exam adjustment schedules. Exams should be labeled in a logical numerical order. When correcting original audits, records should be inactivated rather than deleted. Alternatively, a zero could be entered as the taxable amount. Any inactivated or zero transactions will stay in the WATS file, but will not print out on the detail exam adjustment schedules. All columns with entries must have a heading. Column headings should be descriptive of what is scheduled in the column. Excel schedules should have a footnote indicating the source from where the scheduled information was obtained (i.e., taxable sales on Exam 1 were obtained from Sales Journal 202). Excel schedules should have a footnote indicating where the amounts scheduled are forwarded. All calculations made must be shown and documented on the schedule. A tax reconciliation was performed and it was determined that the period 0607 had tax collected and not reported in the amount of $1,000. This tax amount of $1,000 must be converted to an amount subject to tax. The calculation to perform this (assuming an 8.25% tax rate) is $1,000 ÷ .0825 = $12,121.21. This calculation must be shown on the schedule in a columnar format. The audit period must match the taxpayer filing type. Every period must be listed when the filing type has changed. This screen is accessed through the Exam Date Screen. Detailed footnotes need to be used for all exams. The Sample and Population bases should be completed for sample exams. This screen is accessed through the Exam Data Screen. This is used to constrain outlets, reports periods, or both. To constrain means that those outlets or report periods will not be included in the projection. Be certain that the correct outlet(s) and/or report period(s) have been constrained. Located on the Exam Data Screen, this factor is a multiplier that reduces or increases the error percentage for sample exams. It can also be applied to detail exam (it is a multiplier to each individual entry on a detail exam). The factor needs to be shown as a decimal, e.g., 95% would be shown as .95. Two modification factors can be used on the same exam. This problem usually occurs when the audit period is changed after transactions have been entered. Check the dates on the Assignment Information Screen. WATS also has a report option which will summarize adjustments by date. Analyze the Detail Population Base Report and confirm that all external amounts are listed. Be sure to enter Population amounts for each report period even if a supplemental schedule shows the amounts by period. The Sample Base may be entered as one summarized amount if a supplemental schedule shows the amounts by period. Inactivate the exam on WATS before it is sent to the Processing Center. Inactivate the transaction before sending the audit to the Processing Center. Or, change the taxable amount to zero and also allocate taxes to State or a local jurisdiction. When changing the audit period or filer type for specific report periods, be sure to save the changes. Verify the audit period on the Assignment Information Screen before submitting the audit to the Processing Center. Verify the audit period setup on the WATS Assignment Information Screen to the audit history and verify with the XIDATA/XIPMTS inquiries. The exam must also be inactivated in order for the audit to upload.